When Michael Meyer pieces together an eighteenth century map, commissioned by the Manchu emperor Quianlong to "record the outline of every building on every street" in China's capital city and that is printed today on 500 sheets of paper, the portion with his neighborhood alone fills his living room. It is also almost identical, he discovers, to the image captured by Google Earth's satellite, and on it is a house standing on the same spot as the house in which he lives. Meyer lives on Red Bayberry and Bamboo Slanted Street,in a neighborhood of narrow lanes and low-built houses. Beijing was originally made up of neighborhoods like his, called hutong, a word that dates back to the days of Kublai Khan. His hutong is one of 114 found in Dazhalan, Beijing's oldest community. Dazhalan is the same size as Vatican City, but while the home of the Pope has a population of 557, Dazhalan has 57,000 residents, 1500 businesses, 7 temples, and 3,000 homes. It lies in the Old City of Beijing, "an area slightly larger than Manhattan...centered by the Forbidden City." Within this historic framework, the small residential universes of hutong are rapidly disappearing, being erased by the invisible--and universal-- bureaucratic entity that Meyer calls "The Hand." The architectural wonders of modern-day Beijing are shown in breathtaking photographs in Vanity Fair and other upscale magazines, glorious buildings that make New York City look decidedly behind the times. The world's most noted architects are being used to turn a municipality that is larger than Connecticut into a city that will lead the world, while lesser known practitioners of architecture are designing high-rise suburban apartment buildings that will house those who are displaced by Beijing's new urbanity. The hutong neighborhoods, such as the one that Meyer inhabits, are called "urban corners" or "villages in the city" by Beijing's city government, places with a "chaotic environment" that are fire hazards and potential breeding grounds for crime. They are horizontal neighborhoods that are being crowded out by the new vertical Object Buildings in what Beijing architect Zhang Yonghe calls "a City of Objects." When Meyer describes his living conditions, it certainly seems that Beijing's urban planners have a point. His hutong home is two rooms in a crumbling courtyard house, in which the polished marble floor contrasts with the straw-and-mud walls, there is no inside plumbing, and electrical fuses are so easily blown that Meyer uses his refrigerator as a closet. His morning ablutions are performed under a cold-water faucet in the courtyard, and his first outing of the day is when he saunters to the men's latrine, which he says "is a route I have timed flat." The Big Power Bathhouse, a place where customers can drink a beer while they shower, or pay for the exfoliating services of an elderly gentleman who wields a mean scrubbing mitten, is Meyer's neighborhood hygiene center. And yet while his living conditions are spartan, Meyer lives in a human community that is functional beyond belief, when judged by Western standards. In his neighborhood he is known as Little Plumblossom, the teacher who volunteers at the hutong elementary school, which is a four story building surrounded by so many different kinds of trees that Meyer's students cannot count them all, "a sea of grey and green." There is one hutong rule that all residents abide by, "Public is public; private is private," and it is so strictly adhered to that Meyer's security is maintained by a simple padlock. His neighbors become his friends, particularly "The Widow," a fierce chainsmoking woman in her eighties, who feeds Meyer with food and conversation. She loves the hutong, because living in it keeps her "feet on the ground" and "connected to the earth's energy" which she would lose by living in a high-rise apartment. This is the world that is threatened by Beijing's modern transformation. Narrow lanes that connect the lives of those who live in them are being displaced by streets that are as wide as highways and virtually uncrossable by pedestrians. High-rise apartment compounds far from the core of Beijing have no courtyards in which communities can develop. Over-crowding is being replaced by severe isolation, and people who have lived in spaces that are almost medieval are being tossed into modern living conditions in a way that guarantees severe culture shock. 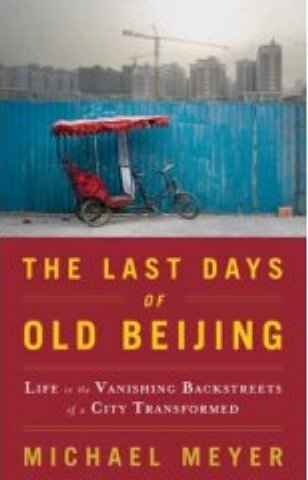 This is a story that only a hutong resident could tell, and Michael Meyer presents it, warts and history and humor and all, with the perspective of a man who bathed under a cold-water faucet every morning for two years.